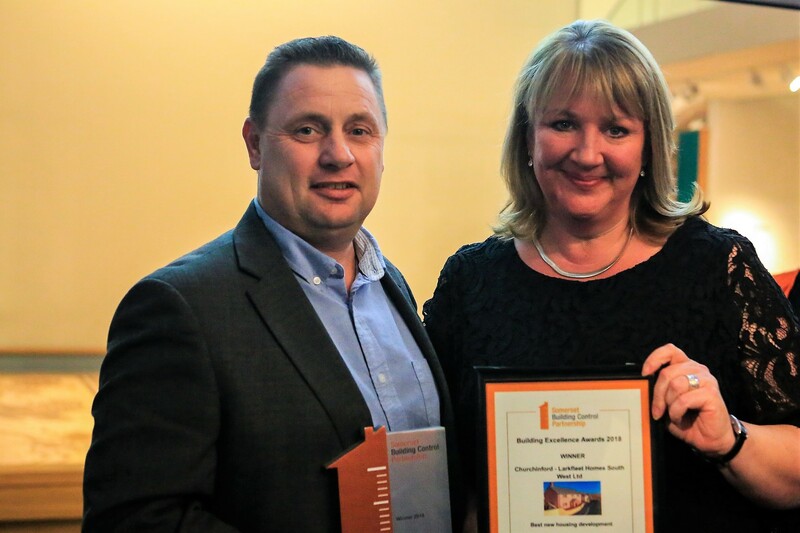 Larkfleet Homes South West has won Best New Housing Development in the Somerset Building Excellence Awards for its Churchinford Hills development. Its development at Creech St Michael was highly commended in the same category. The Building Excellence Awards are run by the Somerset Building Control Partnership of which Sedgemoor District Council, the area in which Churchinford is located, is a member. Churchinford Hills will now go forward to the regional Local Authority Building Control (LABC) Awards to be held in Plymouth in April. It will come up against an array of other projects from across the whole of the South West of England. The development is set deep within the Blackdown Hills, a designated area of outstanding natural beauty. Areas of outstanding natural beauty enjoy significant conservation protection and planning is strictly controlled. Larkfleet Homes South West won the award because it was able to demonstrate building excellence by using traditional methods of construction. Loose lay flint stone, hand laid thatch, natural slate and a variety of renders were all used in the development. These were built into new homes encompassing modern construction methods and modern elements to ensure building regulation compliance. Churchinford Hills is an exclusive 20-property development of 2, 3 and 4-bedroom detached and semi-detached homes, incorporating affordable housing, situated in a unique rural position. The development is enclosed and screened by existing hedgerows and trees on both the northern and western boundaries. The site also has magnificent views across the Blackdown Hills, a rare location that the architects and developers were keen to make the most of. It was considered vital that the scheme protected and enhanced the large open space area to the south of the site as it provides informal recreation space as well as natural habitats for existing wildlife. The existing established hedgerows form part of a protected wildlife corridor, as recommended in the ecology report that was drawn up before work began. A footpath network has been linked from the development to both the existing bridle path to the east and to the local amenities to the west. The development has been designed to reflect and enhance the existing residential development near the site, which comprises a mix of locally-sourced loose lay flint stone, natural slate roofs and traditional wheat reed thatch. To complement the traditional materials a palette of cream and light pink renders was used to contrast the red brick features. For more information on the Larkfleet Homes South West developments at Churchinford Hills and Creech St Michael visit www.larkfleethomes-sw.co.uk, email enquiries@larkfleethomes-sw.co.uk or call 01823 476417.